Is there a demo version of Event Espresso 4 available? Yes, you can try Event Espresso 4 before you buy using our Event Espresso 4 Test Drive website. Is there a comparison of Event Espresso 4 and Event Espresso 3 features? Yes, please take a look at the feature comparison chart. I have an Event Espresso 3 account already, how do I get access to Event Espresso 4? Event Espresso 4 is currently available to the public for sale and is released to Event Espresso 3 users for FREE. If you purchase a Event Espresso 3 Support License you will also have free access to Event Espresso 4. Where is the documentation for Event Espresso 4? All of the Event Espresso 4 documentation can be found here. What if I purchase Event Espresso 4, but it doesn’t have the features I need? If you have purchased Event Espresso 4 support license and find that it doesn’t have the features you need, we are happy to apply a discount (for what has been already paid) towards an Event Espresso 3 support license. Where are all the add-ons for Event Espresso 4? Add-ons being available for Event Espresso 4 are a matter of compatibility. Event Espresso 4 is far more robust than Event Espresso 3 but it doesn’t have all of the additional features (yet). More features and add-ons for Event Espresso 4 will come over time, but they essentially have to be rebuilt to be compatible with our more advanced way of doing things. Why aren’t add-ons included in the Event Espresso (EE4) support licenses? This blog post discusses our decision to exclude add-ons from our packaging and pricing Event Espresso 4 at a lower rate. What’s the status of ____ add-on? Note: At this time, only the First Name, Last Name, and Email Address are pulled from the WordPress profile to the registration form for logged in users. Not currently available for Event Espresso 4. Our developers will develop a solution in the future, provided we get enough requests or sponsors for this feature. However, you may be able to use the “multiple date and times per event” feature, which will allow you to choose different days a single event will span through (say a gym class happening on multiple different days). If you are interested in sponsoring this add-on, please email us. Current ETA is sometime in 2020. Not currently available for Event Espresso 4. Update: https://eventespresso.com/2016/05/event-app-for-check-in-ticket-scanning-now-available-for-event-espresso-4/ Current ETA is sometime in 2016+. We also are are now offering integration with handheld scanners. The “Seating Chart for Event Espresso 4” add-on is available from a third party developer. Not currently available for Event Espresso 4. What’s the status of ____ feature? The Staff manager in Event Espresso 3 has been replace by the People add-on for Event Espresso 4. Please check out the People Add-on for Event Espresso 4. 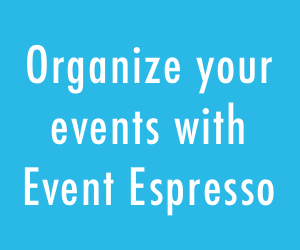 Update: This feature is now available in the current version of Event Espresso 4. What are the current features in Event Espresso (EE4)? … plus many more features! What resources are available to developers that want to integrate with Event Espresso (EE4)? This documentation page explains how we use custom post types in Event Espresso 4. How Do I Change the “events” CPT Slug? This a short example of how to change the “events” custom post type slug. This post explains what files are needed to create themes and child themes for Event Espresso 4. This post discusses WordPress Custom Post Types how we use them in Event Espresso 4. Why did you release Event Espresso (EE4) without all of the Event Espresso 3 features? The reason we decided to release Event Espresso 4 without all of the features of Event Espresso 3 is because we spent a very considerable amount time and money (mostly revenue from sales of EE 3.1) to develop this version from the ground up. We decided to go ahead and release when we felt that it had the necessary functionality to create events and handle registrations. Which is pretty much where we started with the very early versions of Event Espresso over nine years ago. The features in Event Espresso 3 did not get added over night. In fact it took many years of development to get Event Espresso 3 where it is today. In the very early stages of Event Espresso, customers saw potential, provided feedback, sponsored features, and generally helped to keep it in development, bringing it to where it is today. The same thing is currently happening with Event Espresso 4. Our developers are continually adding features and customers are actually sponsoring some of the development.